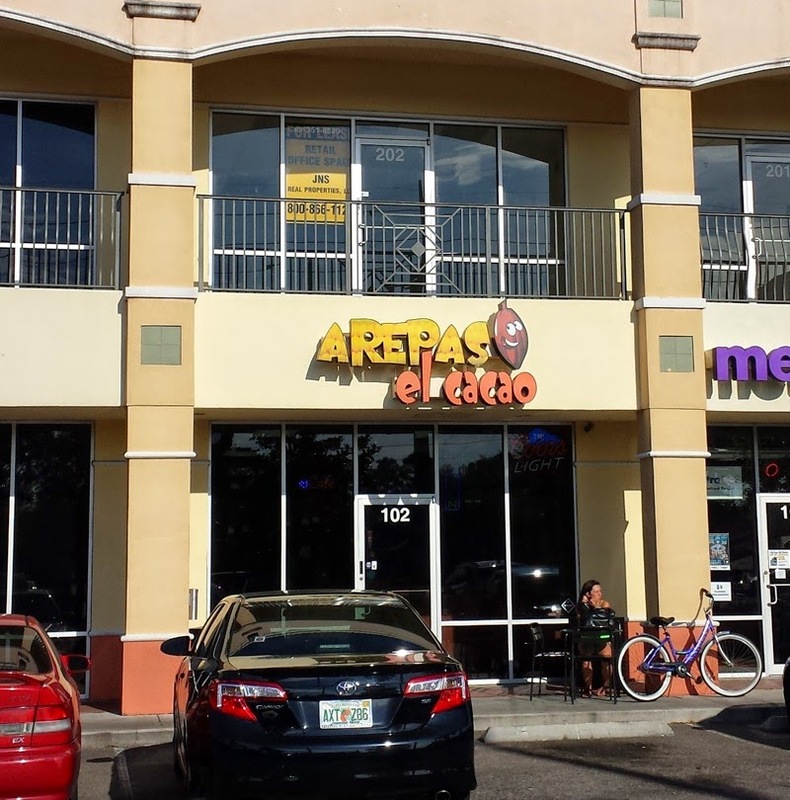 Arepas El Cacao is a Venezuelan restaurant located on Kirkman Road in Orlando. They have a couple other locations as well, either as brick and mortar restaurants or food trucks. 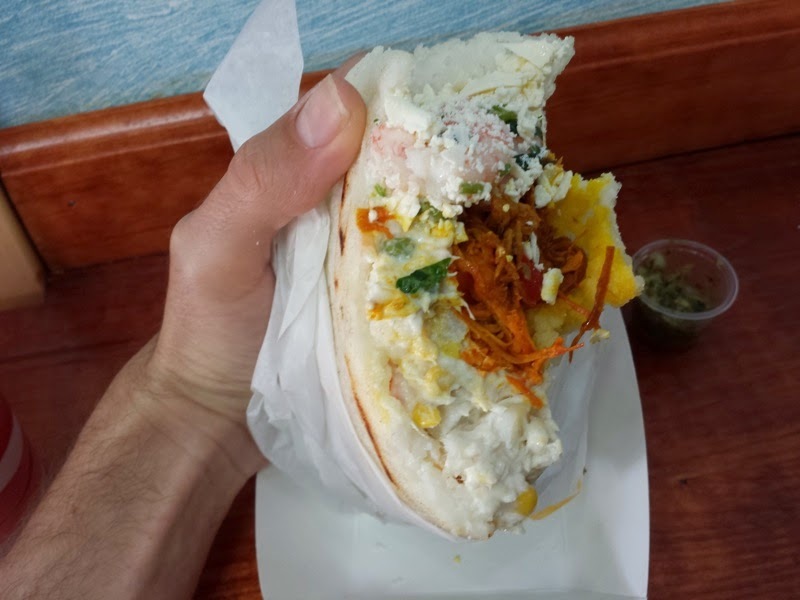 As the name implies, they specialize in arepas, which are corn flatbreads stuffed with various fillings. The El Cacao part of the restaurant's name is a little more confusing since there isn't any chocolate to be found anywhere on the menu. It was explained by a restaurant employee that Venezuela produces the best cacao in the world. Because of this, calling something el cacao in Venezuela is equivalent to saying something is the best. So Arepas El Cacao basically means The Best Arepas. With a claim like that, it must mean their arepas should be delicious. 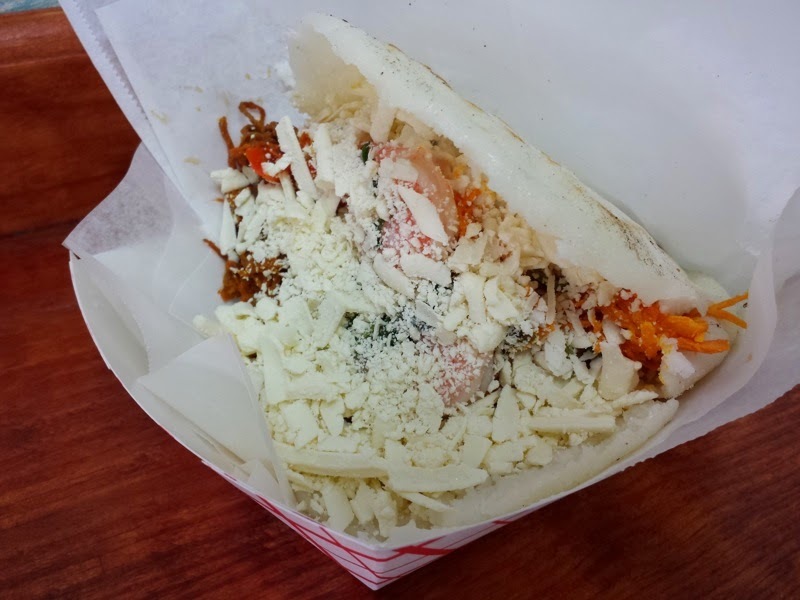 Being that I've visited Arepas El Cacao several times now, their name certainly has been living up to their claim with my very limited experiences with arepas in the past. My favorite arepa here is the Arepa El Cacao #1. This is filled with an insane amount of meats, salads, and toppings. This includes beef, pork, shrimp, chicken, and chicken salad. There's potato salad and beans in there as well. There's also lots of shredded cheese. I think I'm most likely missing stuff. All the fillings in this arepa are overwhelming, but this monstrosity is delicious. It's a huge amount of food for a good value. One of their weekend specials is the option to have a quail egg arepa. 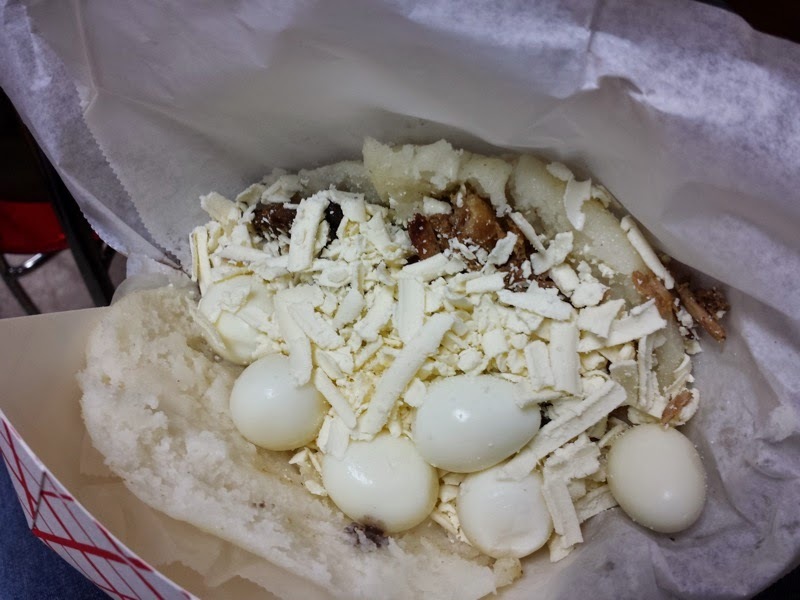 I gave this a try on another visit, getting the arepa filled with pork, black beans, cheese, and the hard boiled quail eggs. I don't think I've ever had quail eggs in the past. The taste wasn't all too different from chicken eggs, but they were much smaller in size. This arepa wasn't nearly as overstuffed as the Arepa El Cacao #1 mentioned above, but still was a good amount of food. 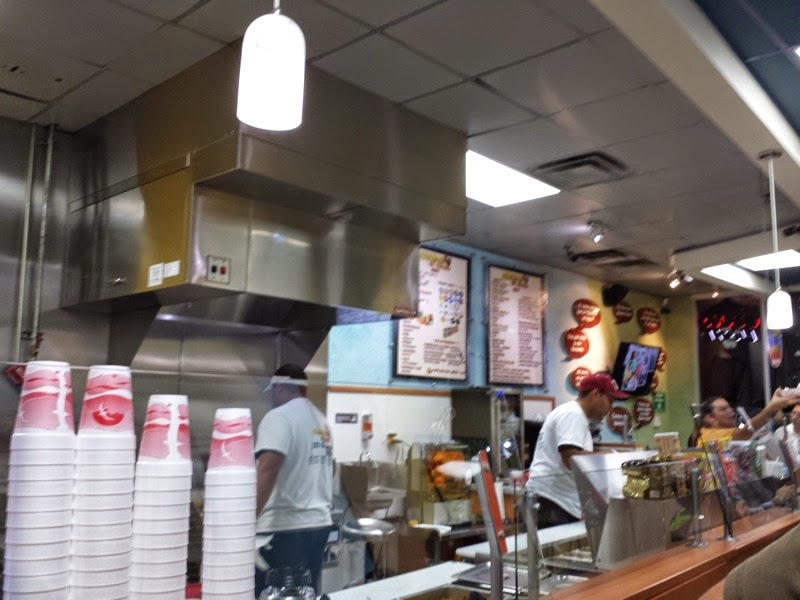 I also tried their soursop or guanabana milkshake. This was my first time tasting this fruit in anything and it was a very interesting flavor. 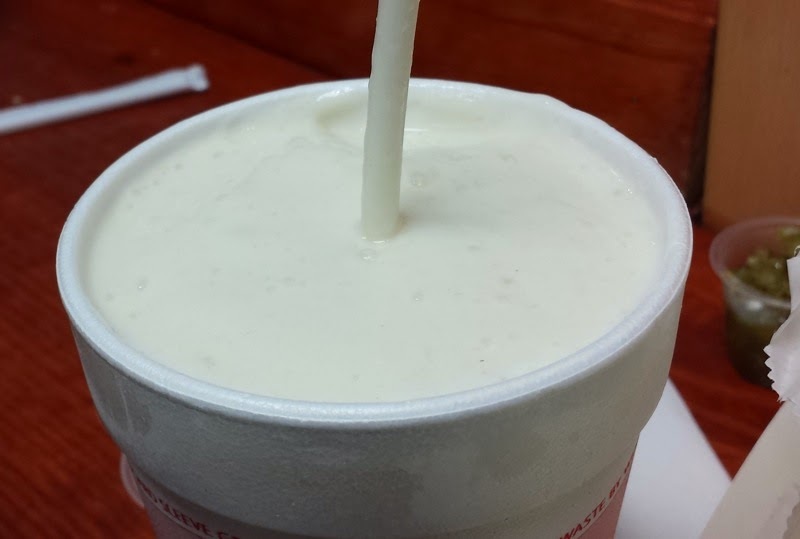 The milkshake tasted familiar, but I couldn't place where else I've tried guanabana. Other than Arepas El Cacao, my other arepa experience is with what is often served at farmers markets and street fairs. That version of an arepa is basically a corn bread grilled cheese. 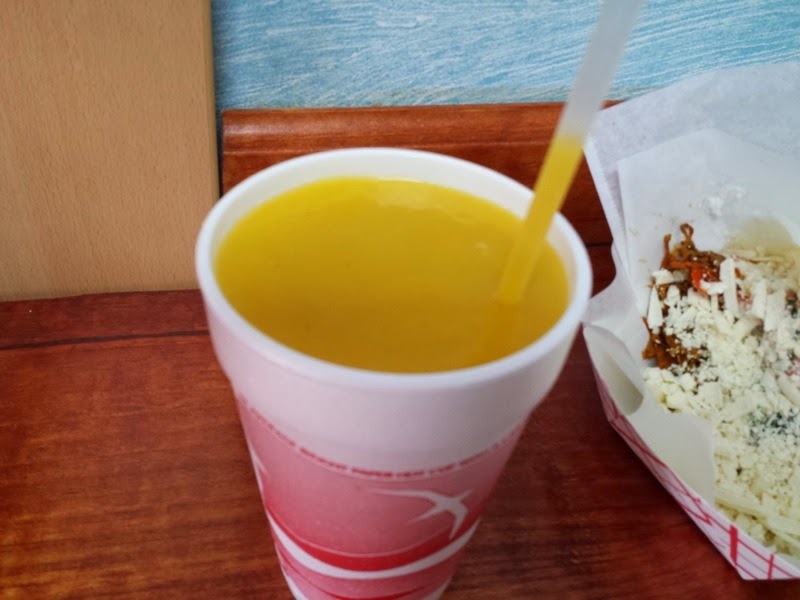 Comparing those to what is served at this restaurant, Arepas El Cacao is the definite winner! 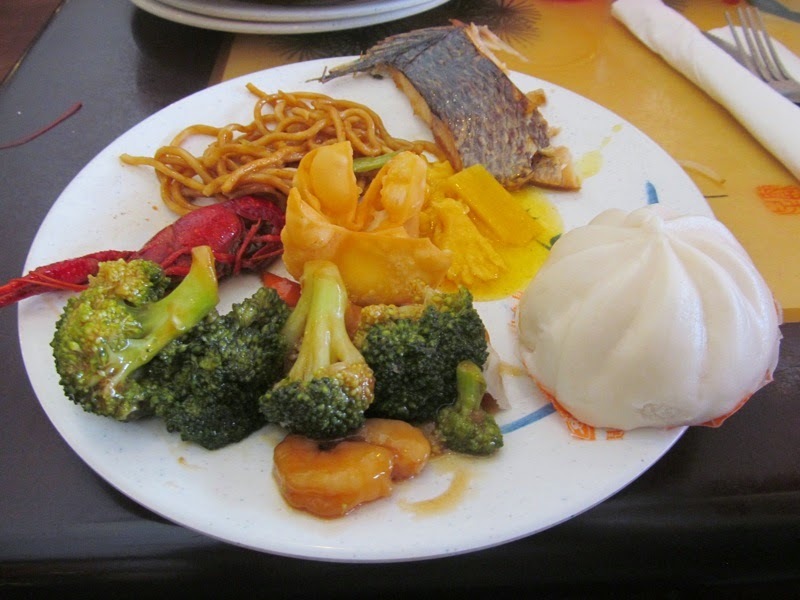 Mei Asian Chinese Buffet is located on International Drive in Orlando. It shares the shopping center with King's Bowl and is right next to the Orlando Eye. Going to a Chinese buffet in such a touristy area was a potentially dangerous choice (not to mention the restaurant has a horrible 34% Liked rating on Urbanspoon), but I ended up enjoying the restaurant more than I was expecting. I arrived at the restaurant during lunch time and they had a good selection of foods. To me, their buffet choices were better than other Chinese buffets in the area and most of the food was pretty tasty. There also seemed to be a good turnover with the buffet tables constantly being refilled. The first plate of food consisted of bean sprouts, green beans, dumplings, tofu, mei fun, and an egg roll. Plate #2 had some salmon, lo mein, crawfish, shrimp with broccoli, and some sort of meat filled dumpling. The third plate had a little more of some of my favorites that I tried earlier (dumplings, tofu, and veggies), along with a butterfly cookie for dessert. I've had far worse buffets than Mei Asian, but yet those have had much higher ratings on online review sites such as Urbanspoon and Yelp. I'm sure the poor ratings for this restaurant are coming from somewhere though. I hope they either saw all the horrible scores and drastically improved their food, just in time for me to show up, or perhaps I just caught them on one of their better days. A few months ago Red Lobster was going to have a blogger tasting event to try their new menu. For whatever reasons, this event didn't happen. Instead, Red Lobster offered to send me a gift card to try the menu on my own time. 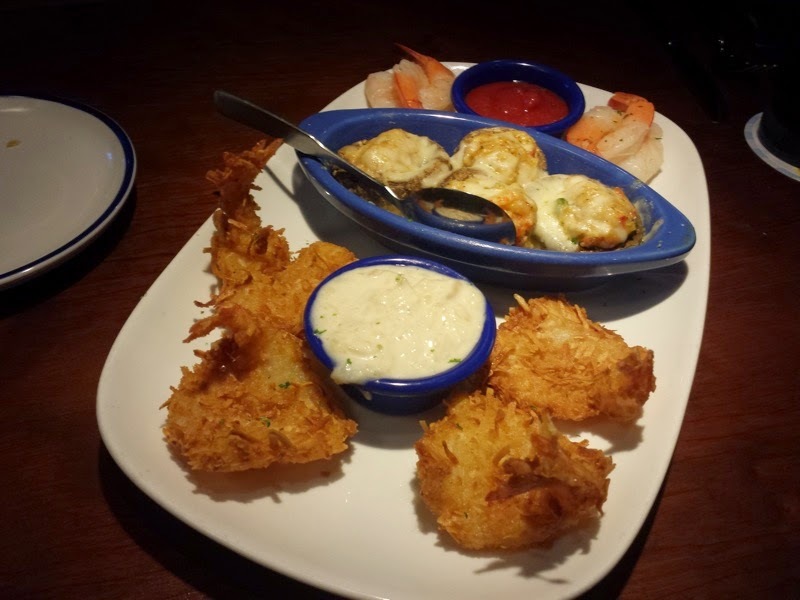 It had been quite a while since I had eaten at Red Lobster and I was interested to see if there were any major changes since the chain is no longer owned by Darden. I took them up on their gift card offer and first ended up at the Red Lobster in Sanford for lunch. 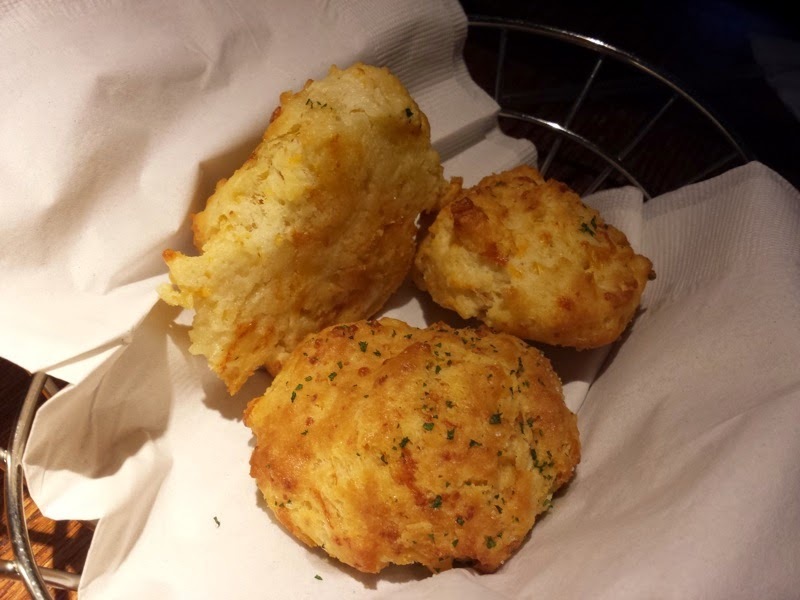 The meal started with a basket of their Cheddar Bay Biscuits. 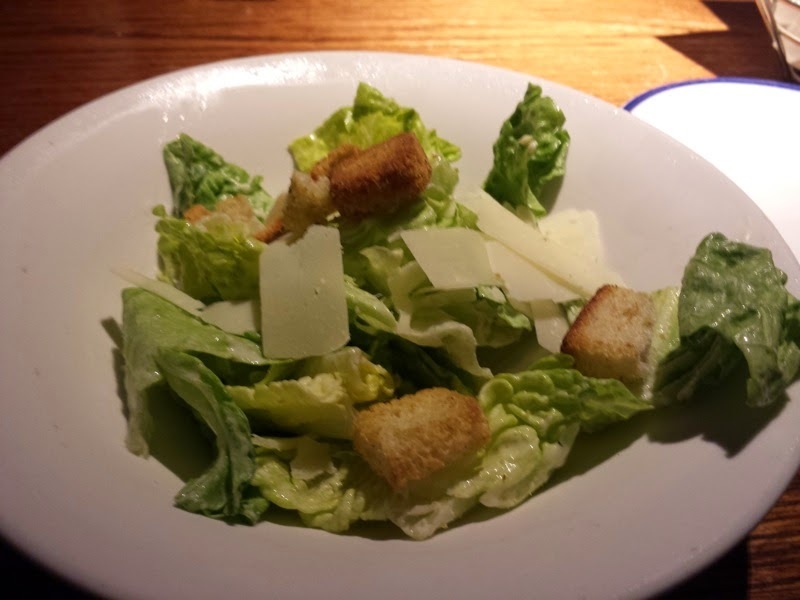 My meal was served with a side caesar salad. I ordered the Create Your Own Lunch. This menu option allowed you to pick two different dishes and a side. I went with the Garlic-Grilled Shrimp Skewer and Garlic Shrimp Scampi. Out of the two, I preferred the shrimp skewer. 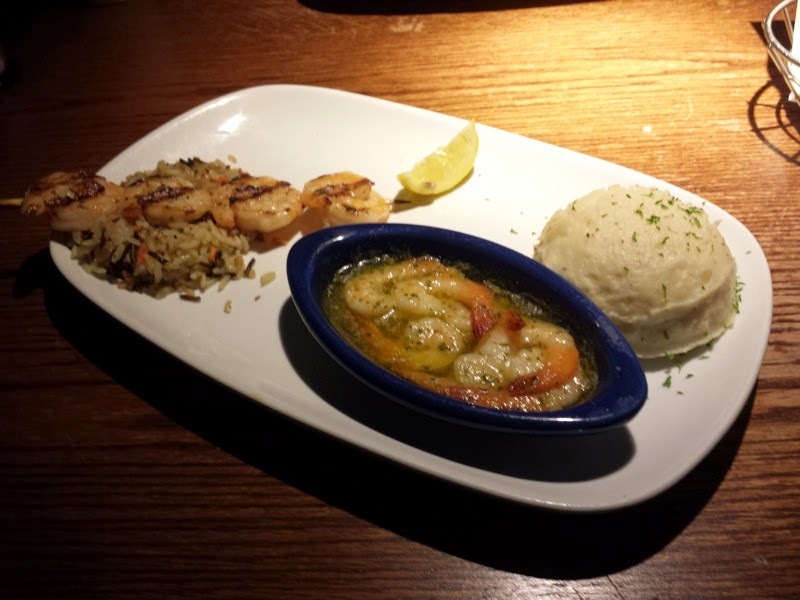 The flavorful, good sized, grilled shrimp were served over rice. The scampi consisted of several shrimp oven-broiled in a garlic butter sauce. I picked the mashed potatoes as my side. My dining companion for the afternoon ordered the Rainbow Trout Lunch with beans and a baked potato. I used the rest of the gift card at the Red Lobster on International Drive near the OCCC. The Seaside Sampler appetizer was ordered to start the meal. It came with Lobster, Crab, and Seafood Stuffed Mushrooms, Parrot Isle Jumbo Coconut Shrimp and Chilled Jumbo Shrimp Cocktail. I'm not a big fan of mushrooms, but the stuffed mushrooms were the tastiest item on the sampler. The coconut shrimp followed, and the shrimp cocktail was my least favorite. Cold shrimp don't do much for me. For my main course, I tried the Salmon New Orleans. This consisted of salmon topped with shrimp, served with mashed potatoes and broccoli for my sides. 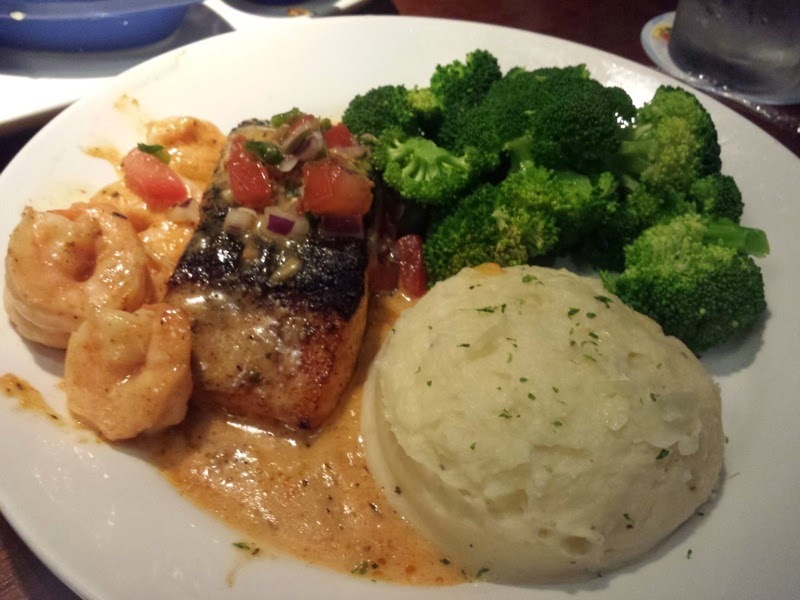 The did enjoy the sauce that topped the salmon and shrimp. The side salads that were supposed to come with this meal didn't arrive until after the main course, after being pointed out that we never received them. Looking around, it seemed like salads at other tables in our section of the restaurant were forgotten as well. This was the only hiccup in both of my recent visits to Red Lobster, and the problem was quickly remedied. Red Lobster seemed like the same restaurant that people either love or hate. I noticed no major discernible differences post-Darden. I know they have new menu items, but as a very infrequent Red Lobster diner, I'm not sure if I would have noticed the changes. The food I tried was tasty and I was full after eating, so I suppose that's the important part! I tried Rosie's Smokin Hot Bar-B-Que in Kissimmee for dinner. This restaurant is located along 192 and has the same owners as Wildside BBQ. While the Wildside locations are full service sit down restaurants, Rosie's is cafeteria style and resembles 4 Rivers (a whole lot). I ordered the sliced pork platter. 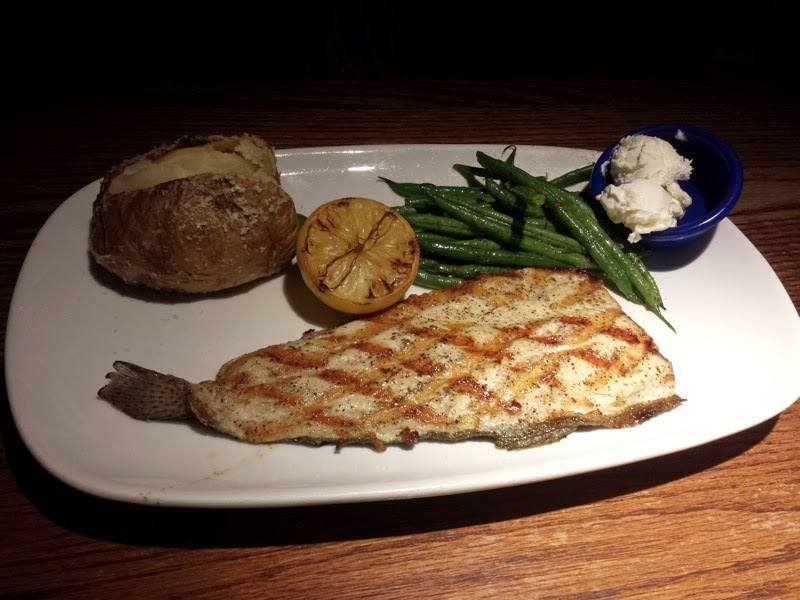 Just like at 4 Rivers, it was served on a tray covered in a sheet of paper. The pork looked good, chopped into larger pieces rather than the typical pulled/shredded pork often found at BBQ places. Unfortunately, the pork was sort of chewy, was very bland tasting, and was room temperature. It was made a bit better with barbecue sauce, but it definitely looked better than it tasted. One of my sides was macaroni and cheese. It was okay, but was also room temperature. My other side was collard greens. These were the best part of the platter. They were really flavorful and contained bits of pork. 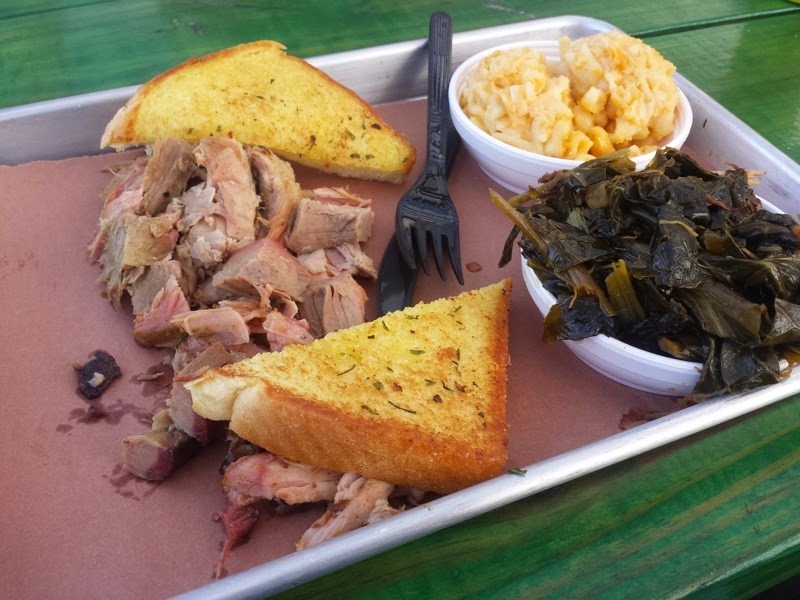 The sad part was that the pork in the collards was much better than the main dish pork. The collard pork was nice and tender and had plenty of flavor on its own, not requiring barbecue sauce. While the collards were good, their temperature didn't seem to be where it should have been either. I suppose the Wildside people thought they would be able to follow the 4 Rivers formula to make a successful barbecue restaurant, but it wasn't working. I don't think I'd bother trying Rosie's again. I'm not sure why but it seems like I've been having bad luck with Central Florida barbecue lately. Smokey Joe's in Sanford had a similar problem with room temperature meats. I've also been to the 4 Rivers in Winter Garden twice since then and have seen quality issues there as well. Hopefully I'll have better luck next time. I can't say I've had much experience eating Chicago style stuffed pizza. Previously, my only meals eating this type of pizza has been at the Giordano's locations near Disney. Giordano's pizza was different and unique in the Central Florida area, but it was also a cheese overload every time I've eaten there. A new restaurant called Chicago's Stuffed Pizza has opened since my visits to Giordano's on Church Street next to the SunRail Station in Downtown Orlando. I was definitely interested in trying this style of pizza that wasn't from a national chain. Being that Giordano's is my only other Chicago style stuffed pizza data point, I'll be doing a lot of comparing in this post. I ordered a personal sized stuffed pizza with sausage and peppers. This pie had a similar crust setup to what Giordano's has. There was a bottom layer of crust covered in the cheese and toppings. A second layer of crust was placed over this, and sauce topped the pizza. I found the pizza at Chicago's to be nicely balanced. Unlike the pizzas I've had at Giordano's, there wasn't a disgusting wall of cheese that came oozing out of the slices. This is a good thing. The amount of sausage, peppers, sauce, and crust seemed to equal out the cheese. There was still a whole lot of each of these, but this stuffed pizza was tall enough to support a whole lot of the toppings. The sauce and sausage both were flavorful. Now that I have a second data point for Chicago style stuffed pizza, I would say that I preferred the pie I had here over what I've had at Giordano's. The main reason for the favor going to Chicago's was a little more balance between the cheese and the rest of the pizza. I think I still would take a more traditional pizza over one of these stuffed pies, but I'd still be willing to get these again.